The US Ambassador to Bangladesh, Dan Mozena recently visited Laharhat Char of Tungibaria union in southern Bangladesh to see CSISA-MI activities. He highlighted that small machines are beneficial to increase yield and reduce production cost for the marginal farmers in chars. Farmers of Tungibaria union in Barisal Sadar Upazila are cultivating wheat using the Power Tiller Operated Seeder (PTOS) machine and Axial Flow Pump (AFP), a new practice that is four times more profitable than their traditional practice of cultivating low-yielding crops such as peas and lentils. PTOS allows farmers to prepare the land, sow seed and spread fertilizer simultaneously, boosting planting precision and saving labor costs. AFP is an inexpensive ‘off-the-shelf’ surface water irrigation technology that reduces fuel consumption for surface water pumping — and thus irrigation costs — by up to 50 percent. Local farmers shared their experiences with the US Ambassador to Bangladesh, Dan Mozena during his visit to Laharhat Char (inner-island) of Tungibaria union on 28 February. “For the past three years, farmers have switched to growing wheat because higher yields can be obtained and the market price for wheat grain is better than lentil,” said Darbesh Farazi, one of the farmers. Commenced in Bangladesh in 2013, under President Obama’s Feed the Future (FtF) Initiative, CSISA-MI is led by the International Maize and Wheat Improvement Center (CIMMYT) in partnerships with iDE. The project seeks to transform agriculture in southern Bangladesh by unlocking the potential productivity of the region’s farmers during the dry season, while conserving that land’s ability to produce quality crops in the long-term, through surface water irrigation, efficient agricultural machinery and local service provision. At Laharhat Char, Ambassador Mozena came across the distinct visual difference between mechanized and conventional practices of farmers of the area. 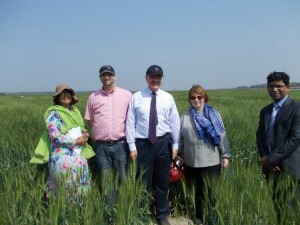 The Ambassador learned about the need for using scientific machinery and precise fertilizer application practices in wheat cultivation and the extra profit that can result from innovative technologies. Used in tandem, small machines like the PTOS and AFP can help ensure the optimum use of fertilizers, reduce costs and lead to higher yields, a huge benefit for the marginal farmers of southern Bangladesh’s chars, the Ambassador said. “In the first year, only two farmers cultivated wheat in the char. Other farmers were impressed with the higher yield and formed a 13-member group to expand the cultivation coverage”, said farmer Rahim Khan. Laharhat Char, still uninhabited, was formed from a sand bar in the main river about 30 years ago. Farmers initially seeded wheat in this land by broadcasting with little knowledge of the right fertilizer rates to use. He shared that using the PTOS to till and seed, timely application of AFP to irrigate the cultivated land, exercising recommended amount of fertilizer resulted in increased yield and reduced production cost. “This season, comparing to lentil, we expect to have a net profit of US $258 per hectare from wheat production,” said Rahim. Kamal Mallik, another local farmer told Mozena, “Earlier, lentil production was around 600 kilograms per 0.40 hectare, but now it seems that wheat production will be around 1,000 kilograms from the same parcel of land; and the net profit is expected to be US $77.25”. Other farmers were so impressed with the crop growth and reduction in planting costs that they hired the LSP to plant additional fields. From this year they have moved to sow wheat in lines by a PTOS operated by a local service provider, using the appropriate fertilizer rates and applying fertilizer using an AFP. During the visit, the Ambassador also stopped at an agricultural fair where CSISA-MI was promoting agricultural machinery. There he met local service providers, machinery dealers, local agriculture department staff, agricultural scientists and CSISA-MI staff. At this event, Mamun Chowdhury, a service provider for PTOS in Laharhat Char, shared that he bought the PTOS for its multiple, simultaneous functions and high levels of precision. “This season, using the seeder, I have provided services to around 55 farmers and have earned around 50% more than the previous season when my service tool was the traditional power tiller,” said Chowdhury adding that he is aiming to extend his business by sowing wheat and irrigating adjacent chars that have been fallow in previous years. CSISA-MI has partnered with large private sector companies, like RFL-Pran and ACI, to leverage its outcomes in the field. RFL and ACI collectively invested over $600,000 of their own funds to scale up access to agricultural machinery. Over 2,500 hectares of land in southern Bangladesh are now under the new machineries, in less than six months since the project began. To reduce purchase risk and facilitate future adoption of the technologies, CSISA-MI introduced a cost discount model, a joint venture agreement in collaboration with the companies’ dealers. It offers vouchers to the LSPs, which makes the PTOS and AFP financially attractive. “This is only the first year of marketing the AFP; we expect that next year the pump’s demand will double. The seeder will need three to five years to take over the market. People don’t know or understand much about the seeder as there was no such machine earlier, more seeder demonstrations will help increase its demand.” said Syed Md. Asraf, Director of Machinery Stores, one of the AFP dealers of RFL-Pran in Barsal.